So, I’ve made a start on Operation Bedroom Sanctuary (which was inspired by A Hell of A Woman’s 12 Days of Buffy Challenge), which means that I’ve started discovering loads of things that have just been put away and forgotten about. From left to right: Red square (Hermès), floral and graphic patterned (Paul Smith), lurex zig-zag (Missoni), green (Jigsaw), black and brown horse pattern (Next). Hermès: I bought this in a vain attempt to be more chic. I have worn it quite a lot, it looks great as a pop of colour against a simple black outfit. I have long since decided that I will never be truly chic. Firstly, I think that true chic is perhaps innate and that I’m trying too hard, and secondly, I think my hair is against the whole idea and it seems impossible to be chic with hair that often resembles a poorly constructed bird’s nest. Incidentally, I was pregnant straight away the second time around too – but that time I was ready for it! Missoni: This is a party scarf- one that I used to take to work back in my pre-mothering days when I went out for a drink straight afterwards. It’s sparkly, and bright and lifts a dull work outfit really easily. Lots of memorable evenings have been had whilst wearing this. Jigsaw: This is one of my true ‘comfort blanket’ scarves. I wear this a lot, and throughout my last pregnancy, when I had a mind like a sieve, I must have lost it a dozen times. I left it on the bus once, and was completely inconsolable about it. So much so that I ended up in the lost property section of the bus depot in the early hours of the morning to get it back. Next: This is a recent purchase and I’ve worn it almost every day since I bought it for the princely sum of £10. A true Fashion Maths bargain. So, I will wear all of these more often, and give the boxful of ones I don’t wear to the children who love nothing more than a spot of dressing up. 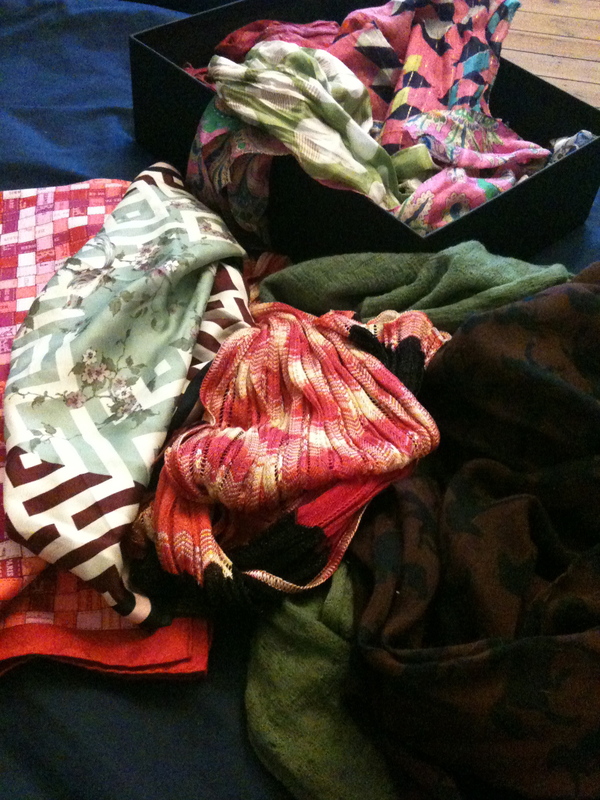 In principle, I love the idea of scarves. Like you say, a splash of colour to any outfit. BUT, I don’t get how to wear them. Are you supposed to casually fling them on? artfully drape them? tie them? or is there some kind of magic word you have to say before you can achieve that perfect combination of “I’m so chic” and “this? oh, I just found it in the wardrobe and threw it on”. They are a bit of a clothing mystery to me. I think my favourite of yours is the Missoni. Of course, I have no idea who Missoni is. I’d have probably described it as “that red zigzaggy one of yours”. *sigh* I will never be a fashionista!